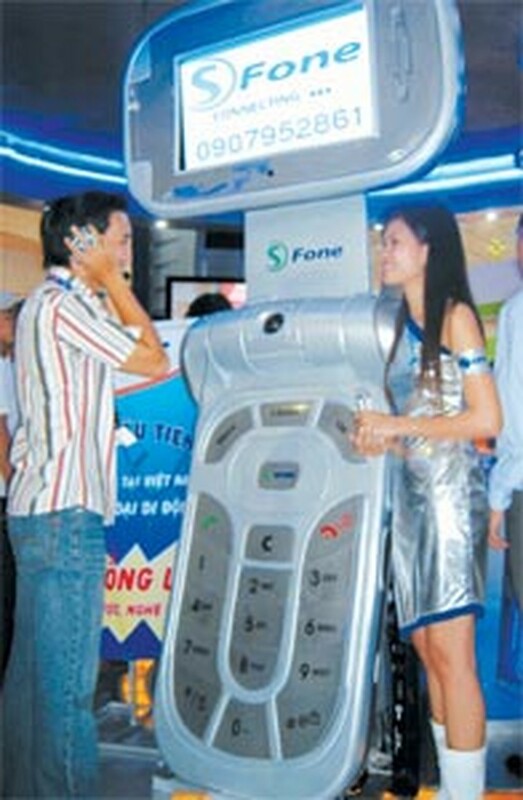 A giant mobile phone is showcased at SPT (Sai Gon Postel Telecom) stall. 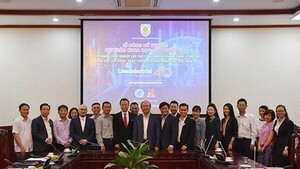 This September is Vietnam Telecomp – Electronics 2006, a premier telecommunication exhibition in Viet Nam, providing an invaluable snapshot of the mobile phone business. The top names in mobile communications were all there. Ericsson showcased its smart mobile phones models, including the M600i which can run Word and Excel editors in both black and white covers; and the P990i offering everywhere access to the Internet and touch screen. Ericsson also debuted its W850i Walkman phone, a cool slider made for music with 1 Gigabyte Memory Stick support, 2 megapixel camera with flash and W710i designed to support an active, sporty lifestyle. Siemens brought to the exhibition mobile phones with the slogan “Stay Young, Keep Exploring” with cutting-edge features, such as 1.3 – 2 megapixel, Internet access, MP3 player, FM radio, Bluetooth and USB. Nokia’s N series stood out with entertainment-focused functionalities like 4 GB external memory, 2 hour movie record, and 3.2 megapixel digital camera. Motorola introduced the MotoMing, ROKR, poised to hit the stores this year. At the exhibition, Japanese NTT DoCoMo made its first foray into the Vietnamese market by offering its mobile communication service i-mode Felica, giving mobile phones wallet-like functions, for the first time. Felica leverages the convenience of the handset with cashless transactions for everything from booking airplane ticket to shopping. NT DoCoMo also displayed its 3G mobile phones integrated with dozens of state-of-the-art features. Nokia provides low-price MMS (Multimedia Message Service) with the fee of about 10 US cents 10 seconds of message. A myriad of cutting-edge mobile phone models and mobile communication services at the Vietnam Telecomp – Electronics 2006 showcased the significant development in mobile phone industry, redefining the role that mobile communications play in our lives. The exhibition was ended on Saturday.